Sunday 23rd April 2017 – The outdoor season has not even reached May and yet Laura Roesler (USA) is already the proud new owner of a world gold medal. 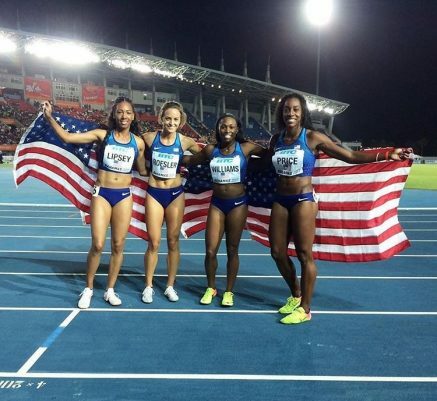 Representing the United States at the third edition of the IAAF World Relay Championships in the Bahamas, Laura ran the third leg for her victorious 4 x 800m team. Individual medals remain the goal for the season but it’s nice to have experienced the top of the podium already. Ristananna Tracey (JAM) also added a first senior World medal to her collection as she and her Jamaican teammates took bronze medals in the inaugural running of a mixed 4 x 400m relay. Elsewhere in the Bahamas, Christine Ohuruogu (GBR) ran for the British women’s 4 x 400m team that finished in fourth position and Matthew Hudson-Smith (GBR) was in the men’s 4 x 400m where the British team were sixth. Jenna Prandini (USA) was part of a strong American 4 x 100m quartet that qualified fastest for the final. Unfortunately, in the final that was run in wet conditions the lead leg runner slipped and their chance was lost. Shamier Little (USA) showed her good shape again with victory over 200m at the Michael Johnson Invitational in Texas. Despite the wind being above the legal limit her 23:01 clocking will breed confidence moving forward.